Meet very handsome Tundra! 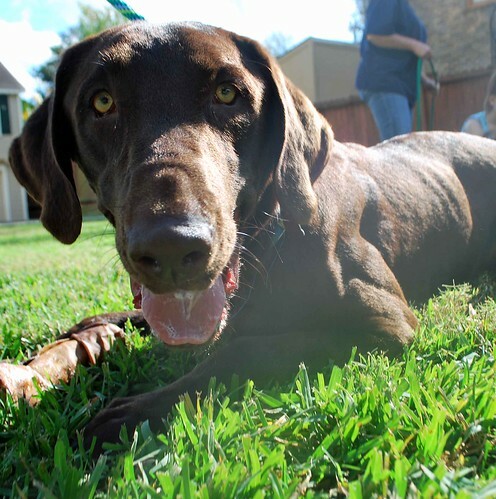 Tundra is a 1.5-year-old chocolate lab. Tundra was rescued from LaPorte Pound and was so sad and super skinny. When he first came to Scout's Honor Rescue, he was thin and boney with swollen paws and soars all over, and his coat looked just awful. Silliness is a must when Tundra is in the room. Remember the “Marley Mambo”? This boy puts a whole new twist on it. Tundra’s entire body fills with such excitement; I think he might burst with happiness! He can go from a dead sleep to wiggling head to toe in the nanosecond it takes you to walk in the room. Happiness is contagious and Tundra is living proof. If you can be around this dog without your day brightening and without giggle….well, then you don’t deserve him! Tundra is a great companion. He loves to go on long walks, and he absolutely adores toys of all kinds; ropes, squeakies, and balls. He can fetch, sit, and stay. Tundra is great with other dogs and kids. He is not a huge fan of cats and will bark at them. Tundra is also house trained.